Nope, I still haven’t been to Goa in my life so far, so this is going to be a list without Goa in it!!! Is it a cardinal sin?!!!! Lolz… When I say Romantic, I’m meaning those beaches which are less crowded and secluded!! 1. Thiruchopuram Beach, Puducherry - This beach tops any list of beaches, I’ve ever been to in my life!!! I don’t think I’ll ever come across a beach more beautiful than this!!! Located close to Puducherry, this is pretty much in the middle of nowhere, with the road that leads to it, in a very pathetic condition, which is kinda a blessing in disguise that prevents tourists from reaching there! This is unfortunately the remains of a tsunami affected region. The ruins of the structures that were here gives the place a very interesting landscape! This isn’t a tourist spot. Apart from a couple of locals, there wasn’t a human on this entire place apart from me & my guy!!! 2. Paradise Beach, Puducherry - There are some beaches in India which are rather unique, in their landscape. Located on a small piece of land which aren’t islands but disconnected majorly from the mainland by backwaters except for a tiny little connection somewhere (kinda opposite of what a 'gulf' is). Paradise beach is like that. A ferry ride is needed from the main land to reach this side. This isn’t an untouched beach, but has very less number of people in it! The sand is pristine. There are few shacks and few shops! 3. Mudaliyar Kuppam, Chennai - Similar to Paradise Beach, this too has to be reached from the main land by a ferry ride. We were a gang of 7 of us who went there and when we went we were the only humans on the entire stretch of beach!!! Need I say more??!!!! But there’s more, you could do some speed boating or kayaking here as well!!!!! 4. 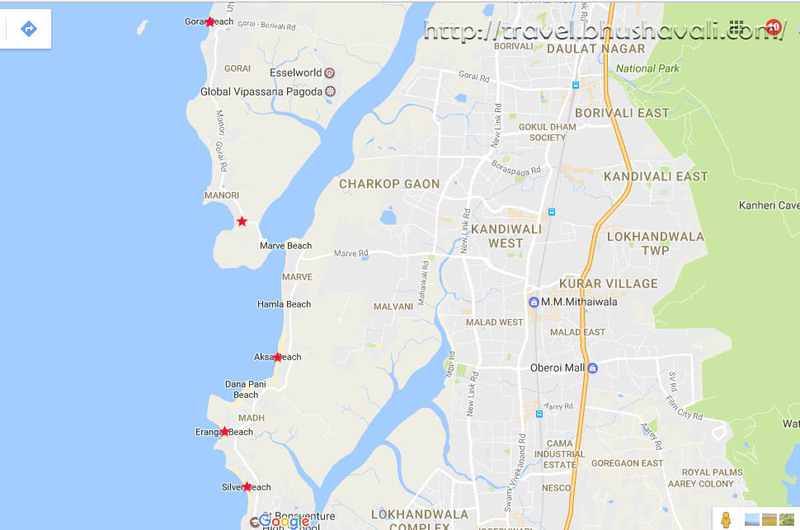 Gorai, Manori, Erangal, Aksa & Madh Beaches, Mumbai - To even understand these beaches, it is necessary to look into the map. There are 2 backwaters back to back here!!! A ferry from Gorai Road in Borivali in mainland takes you to an almost semi-island like area, on the other side of which is the Gorai beach. Manori beach is close to this. Again, a ferry ride is needed at Marve to get to the main land which again is another semi-island at this location!!! Here are the Erangal, Aksa and Madh beaches. Again, a ferry ride from Versova takes you to the main land! Almost all the beaches are quiet with just no-one except local fishermen. The sand here is There’s a beautiful church in Erangal and a fort in Madh! 5. Tenneti Beach, Vizag - Located very close to the city, this is somehow often overlooked! Located at the base of Rishikonda hill, many climb the hill, have a look at the beach from atop the hill and skip going to the actual beach!!! With the Tenneti Park just beside it is one of the most beautiful sunrise you’ll ever witness! Want more options of Romantic Beaches? Instead, looking for beaches to go with friends or family? Check out this Interactive Beach Guide of India by Expedia! These are some lovely beaches. I love your enthusiasm for the beach near Puducherry. How cool to be the only two people on the beach. I'd love to see the sunrise at Tenneti Beach. Growing up on the west coast of the United States, I have seen a lot of sunsets over the ocean, but not sunrises. I've heard good things about Puducherry, I didn't know it had beautiful beaches too (and romantic!). The pic of you jumping on Paradise beach is impressive, you had the whole beach to yourself! The beaches in Portugal you need to take a ferry ride to them which, if you're lucky or you go early enough can mean they are empty. The beaches in Mumbai sound fantastic to get away from the dense city. It's nice that the beaches are not too congested. We have a lot of excellent beaches here but some become too commercialized. Very intresting article. 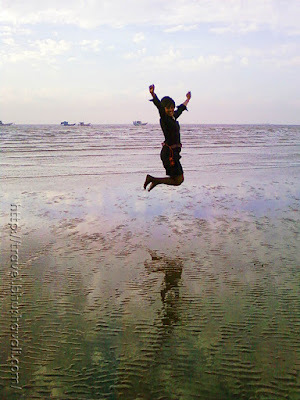 I am huge beach fan and I liked reading your article about the different beaches. Especially interesting that some beaches like paradise beach are formed in such a special landscape. I have read a lot about India as it is definitely on my bucket list. But have not heard much about India's beaches besides those in Goa. India truly does have so much to offer. I like how the ones you outlined here are not crowded. Definitely makes for a better experience. Wow you've discovered some gems!! I've always loved a quieter beach for relaxation. These look like the places where you can have a higher-quality beach experience that doesn't involve fighting for spaces! Thiruchopuram Beach is definitely a very beautiful beach! Such a shame it comes with the sad story of a tsunami. Is that beach crowded during high season? This is actually a great list to know about! Thank you for sharing with us and will make sure to pass by a few when we go back to india! Interesting list of beaches. I do not really think of beaches when we think of India, since it is more known for its culture and religion, not really beaches. Then you realize that India has a very long coastline! I can't believe how secluded these beaches are! Having never been to India myself I've always been under the impression that it's a highly populated place. Good job for finding beaches with no one on them!! Beaches of India without Goa, what a nice surprise! The ruins on the beach definitely give it a beautiful view. The beaches seem so quiet and non-touristy, it must be a lovely escape from the busy cities. I never thought of India as a beach destination even though it makes sense as so much of the country is on the sea. I love how you included a map! And that jump shot is epic! I m surprised to see this offbeat list. You should have named it the most romantic and offbeat beaches in India :) Though I have visited Pondy, Mumbai and Vizag, I have never heard of these. When in India, there is no dearth of offbeat locations and the list grows endlessly. This list is just so perfect for first timer honeymooners. Good you visited them all already. Awesome romantic beach locations! Its my absolute favorite when there is no one else on a beach, I don't know why but it just feels like your own piece of heaven right? The beach with the reflections looks like it would be epic for sunset or sunrise. Your photos are really beautiful! It seems like India has everything from beaches to exciting cities. Is Puducherry in the part of India that is French influenced? I didn't know it had so many beaches. I would really like to visit there. I've been to India three times now but never to the beach! I was expecting beaches around Goa but there is so much more. I've always said I want to go to Goa. Looks like I need to expand my horizons! Looks like a great list! My husband and I love to visit beaches everywhere we go. Out of the ones you mention Mudaliyar Kuppam seems like such a neat place to go to enjoy the serenity of the ocean waters without it being crowded. These beaches look so pristine and unspoiled by a lot of tourist. The surf doesn't look too rough either! I love places that feel remote, but don't require hours of travel to get there. Totally love the Gorai and Madh beaches! They were so close to Mumbai and were perfect to get away from the madding crowds. The winter months were just perfect to visit the spots...now you have made me want to pack a picnic and head out for the day....that too on on a Monday!! Apart from Goa, I don't really think about India as a beach country. Crazy I know since it has so much coastline. It's great to see there are other good beaches along the coast too. Thank you for sharing. I would also love to include beaches from Kokan and Goa. They are no less than international favorites...Indian beaches are simply the best! All are pretty but I like the Paradise Beach the most. It really deserves it name. I think Paradise beach and Mudaliyar Kuppam sound pretty nice. I visited last year and went to Varkala which was quite nice although it was fairly busy. A nice list! I have been to Paradise beach in Puducherry and those of Mumbai. They are really good beaches without much crowd. I also find Tarkarli beach in Maharashtra a really beautiful beach. I think you could add this to the list too. I have not been to India so far. Your list of beaches seems to be very appealing. Especially I liked the beach where you were only humans on the entire stretch of beach. Must be a very special feeling. Thanks for sharing! My country, the Philippines, is known for its beautiful beaches. I was not aware that India really have beautiful beaches. Whenever I think of India, I think of the colorful culture, many languages and religions.